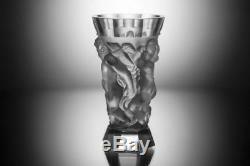 ART DECO Crystal Vintage Czech Bohemian Vase. A breathtaking piece from high quality satin finish glass in Art Deco design. This piece was made in Bohemia in the original antique molds that was used in 1930's. Dimensions: 19 cm x 12 cm x 11,5 cm (7,48 x 4,72 x 4,53 inches). Delays may occur occasionally due to custom procedure or bad weather conditions. Please note these are outside our control and we do not take responsibility for delays caused by custom controls or severe weather conditions. We use high quality packaging and pack items very carefully to make sure you receive them safe. Should you receive a visibly damaged package, please request a confirmation that the package was damaged and file a claim with the postal service. Should such situation occur, please inform us immediately. The item "Rare ART DECO Crystal Small Vintage Vase Czech Bohemian Hand Cut Glass Kids" is in sale since Thursday, June 7, 2018. This item is in the category "Pottery & Glass\Glass\Art Glass\Bohemian/Czech\Other Bohemian/Czech Art Glass".